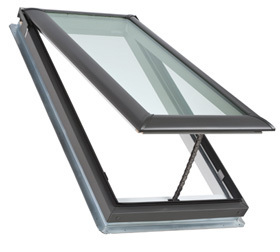 A Velux Skylight comes in four different styles; Solar Powered Venting, Electric Venting, Manual Venting and Fixed. They all come with three layers of water protection, deck seal and the adhesive underlayment and the step flashing. Combining multiple skylights is the best solution for maximum light and ventilation while adding a prestige value to your home. Advanced LoE3 Glass for increased energy effiency, visible light and improved heat gain. Skylights come pre-finished frames and sashes in white. Velux skylights come with pre-mounted brackets if you decide to install blinds. 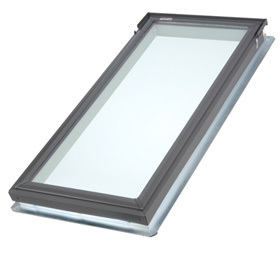 Velux skylights come in various options to suit any home. Integrated gaskets that drain condensation to the outside. 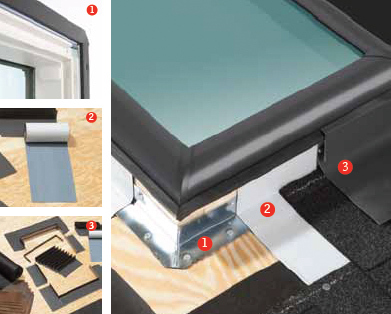 The Velux Deck and Curb Mounted product family is designated with the No Leak Skylight features. This image shows the 3 layer water protection that is installed for deck mounted skylights. The protection also comes on the curb mounted as well. 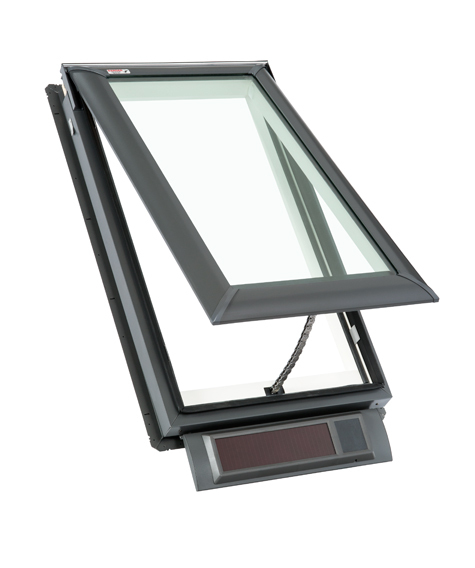 The Solar Powered Venting Velux Skylight is charged by an internal battery and has its own control system. The Velux Skylight comes remote controlled and solar powered. It also comes with a rain sensor that closes the skylight incase of rain. 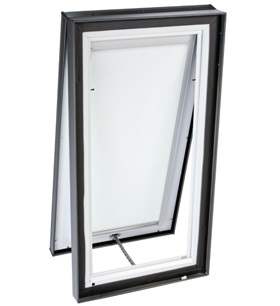 The Electric Venting Velux Skylight is for deck mounted and curb mounted that includes a rain sensor which will automatically close your skylight during inclement weather. It also comes with a remote or wall mounted keypad to quickly and quietly close the skylight. The Manual Venting Velux Skylight is for deck mounting and curb mounting installations and opens to allow stale, humid air to escape. It can also come with either black out blinds or solar blinds that will diffuse the light. The Fixed Velux Skylight comes in curb and deck mounted. Curb mounted are generally used to replace old, inefficient plastic bubble skylights with energy-efficient insulated glass panes. Deck mounted are generally used to light up darker areas in your home, such as hallways or stairways. There is a lot to think about when choosing a Velux Skylight. Choose 1st Choice Home Solutions as your Velux Certified Installer.